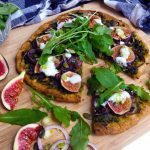 This weeks recipe is another one of my go to histamine friendly pizzas – namely pizza topped with low histamine pesto, fresh figs, caramelized red onions fresh arugula and a scallion cream cheese/yogurt drizzle. 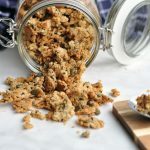 Perfect for this season where the figs are fresh and juicy in the markets. 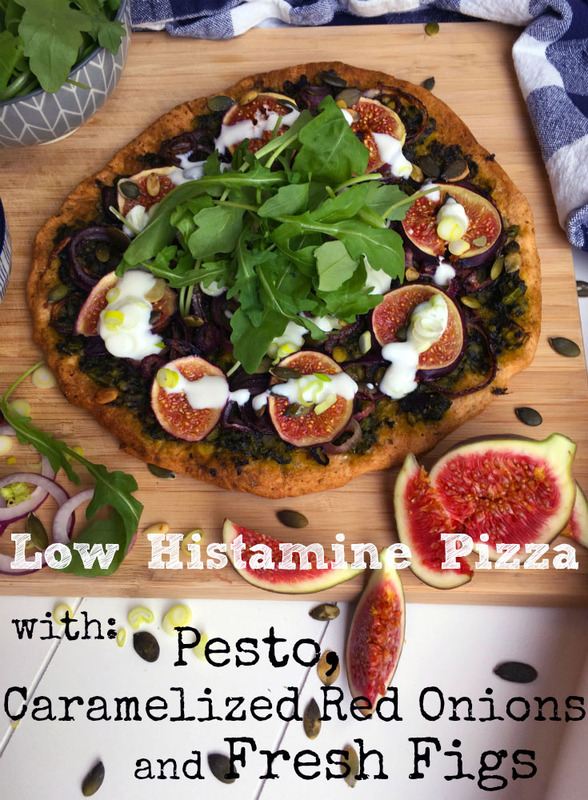 I started using pesto instead of tomato sauce as the pizza sauce, when I first found out I was having issues with histamine. 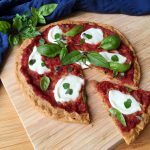 In my opinion it is a great replacement for the tomato sauce taste wise, and as an added bonus you automatically up your intake of herbs and leafy greens. When I make pesto, I often make a big portion and then freeze down the pesto I don’t eat right away in small portions, which I then use for pizza, pasta etc. I make my Low Histamine Pesto with leafy greens, herbs, scallions/shallots or garlic, macadamia nuts, extra virgin olive oil and salt. 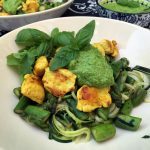 You can find the approximate ratio of the ingredients in my recipe for Zoodles with Low Histamine Pesto and Turmeric Chicken. 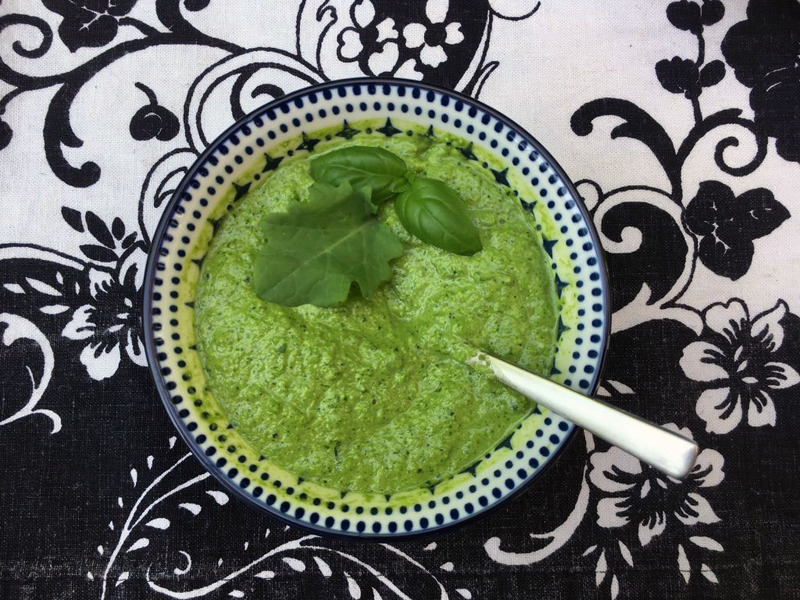 This pesto recipe uses basil and baby kale as a base, but honestly I use whatever herbs and leafy green I have at hand or growing in my garden. So my pestos are never really the same 😉 I also play around with the nuts and seeds a bit. And I like to add pistachios, pumpkin seeds and pine nuts as well. But that is the beauty with Pesto you can make it fit your individual tolerance level. And now for the scallion cream cheese/yogurt sauce to drizzle over your pizza 🙂 Simply mix cream cheese and yogurt with some salt and a finely sliced scallion. 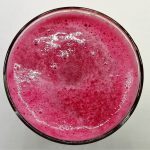 I use cream cheese and yogurt based on goat milk, since I tolerate the proteins in goats milk much much better than the protein from cows milk. Note this has nothing to do with my histamine issues, but is a separate food sensitivity. 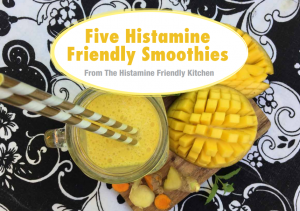 You see that with most people who deal with histamine intolerance, in most case they deal with one or more other food intolerance, sensitivity or allergy. It rarely goes alone. 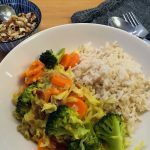 So if a low histamine diet isn’t giving you all the relief you where hoping for, try looking into identifying whether or not other food intolerances, sensitivities or allergies are at play. 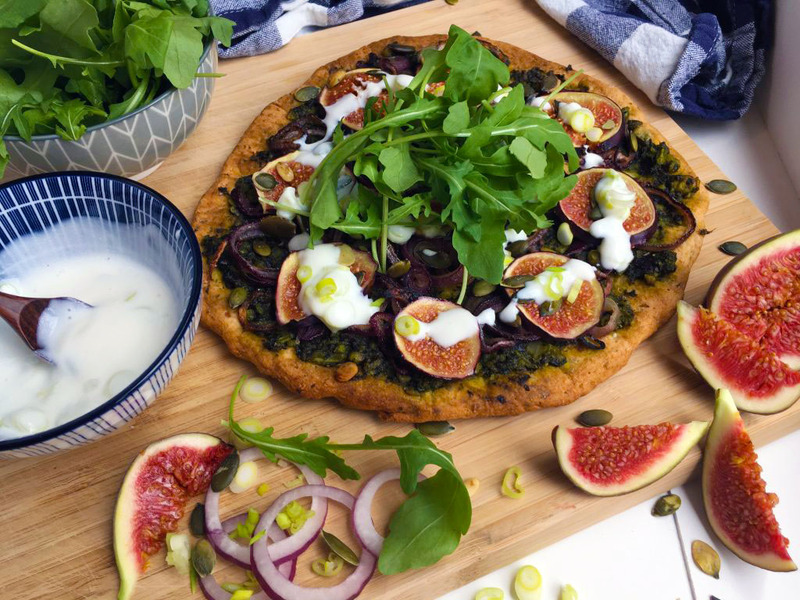 Histamine Friendly pizza topped with low histamine pesto, fresh figs, caramelized red onions fresh arugula and a scallion cream cheese/yogurt drizzle. 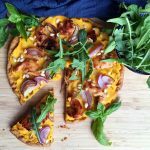 For the base of this pizza I used my Grain Free Low Histamine Cassava Pizza Crust. 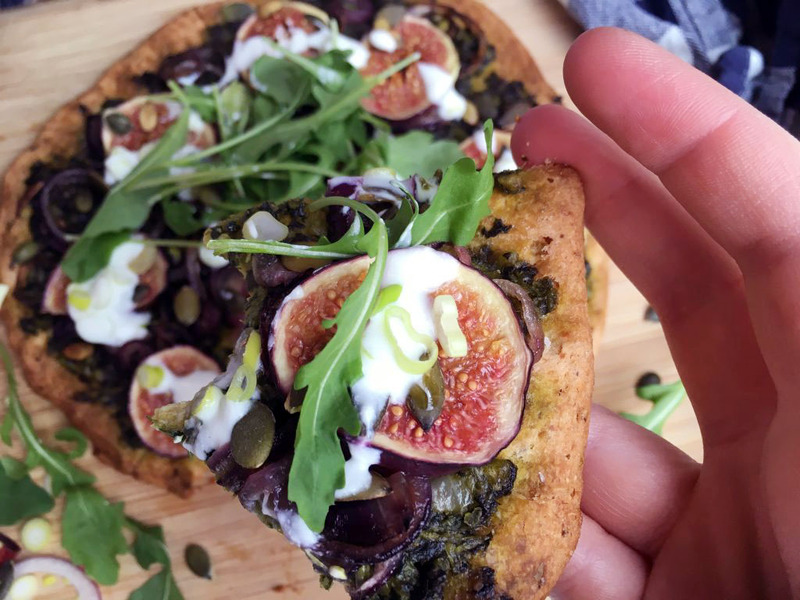 But you can of course use your favorite pizza crust. Cut the red onions in thin slices. Heat up a frying pan with 1 tsp of olive oil and add the red onions. Cook them while stirring till they get go soft and start to caramelize. Don’t let them burn. 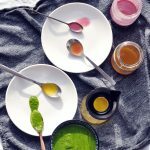 Make the low histamine pesto – following the instructions in my recipe for low histamine pesto. 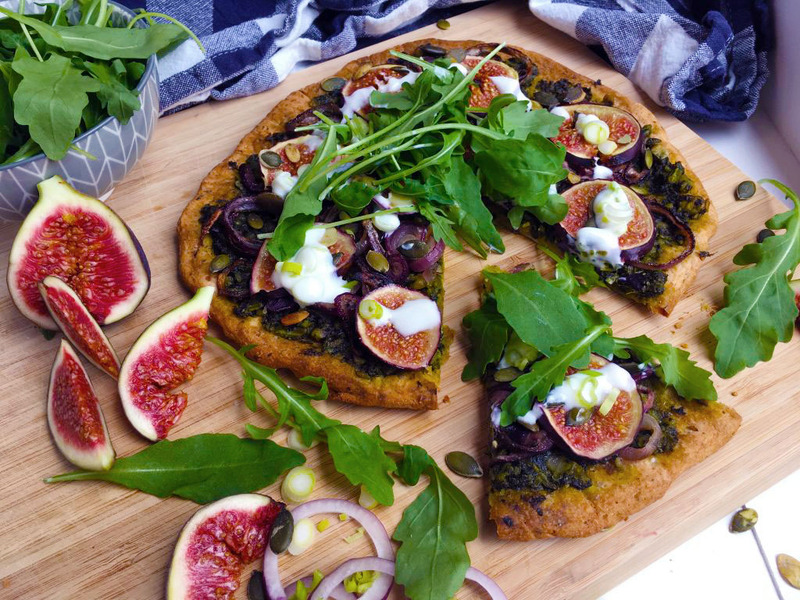 Top your pizza base with a generous layer of pesto, add the caramelized red onions, and thin slices of figs. 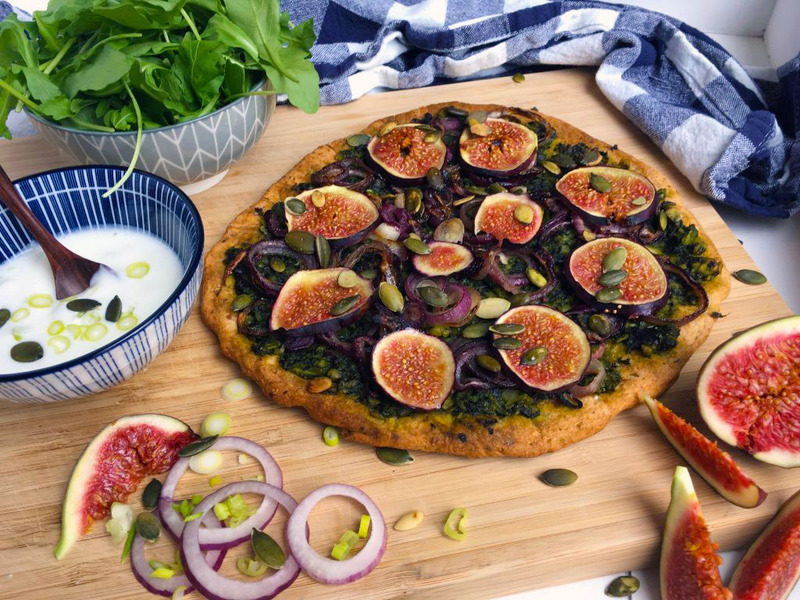 Sprinkle with a few pumpkin seeds if you like and give the figs a drizzle with a little honey. Pop the pizza in the oven for about 8-10 minutes, at 180 °C (360 °F). Be careful to not bake it too long. And now for the cream cheese/yogurt sauce to drizzle over your pizza! Simply mix the cream cheese and yogurt with some salt and finely sliced scallion.